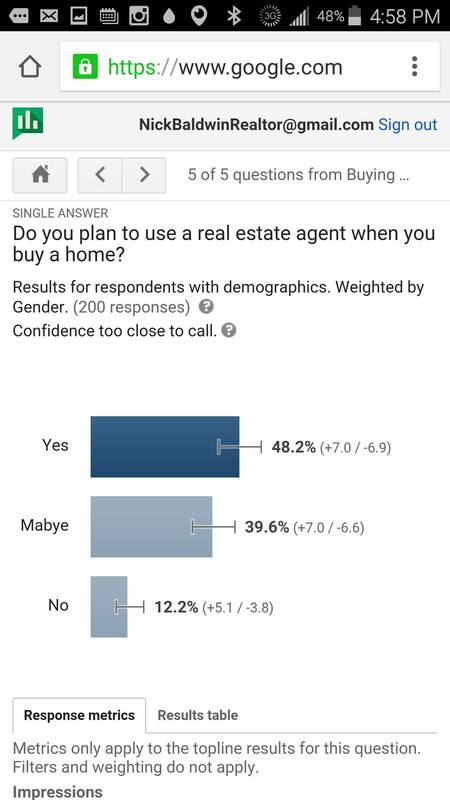 Agents can use Google's Consumer Surveys to collect actionable market intelligence. thinkwithgoogle.com offers detailed information on Google marketing strategies and tools. Dozens of real estate thought leaders recently descended on Google’s headquarters for a presentation from the search giant on how they can leverage Google to grow their businesses. Here are the biggest takeaways from the invitation-only event, according to attendees Nick Baldwin and Tristan Ahumada, who oversee the Facebook group Lab Coat Agents. 1. 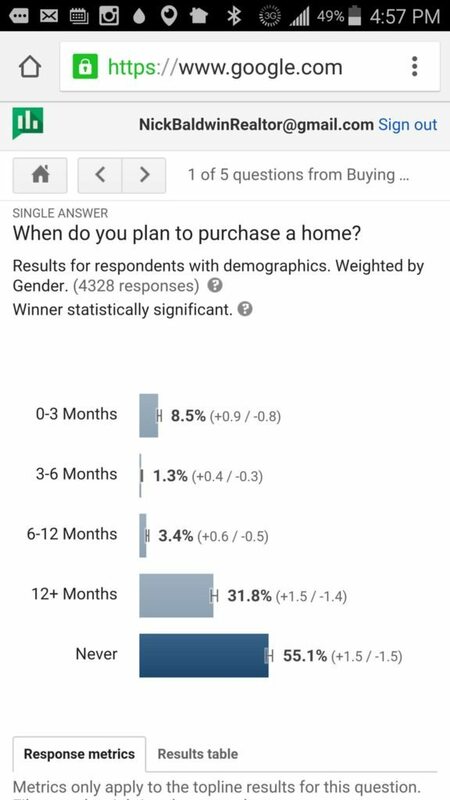 Use Google Consumer Surveys to get market intelligence. Baldwin sees Google’s Consumer Surveys as a relatively cheap way to conduct original research that he can use to educate consumers and sharpen his business strategy. 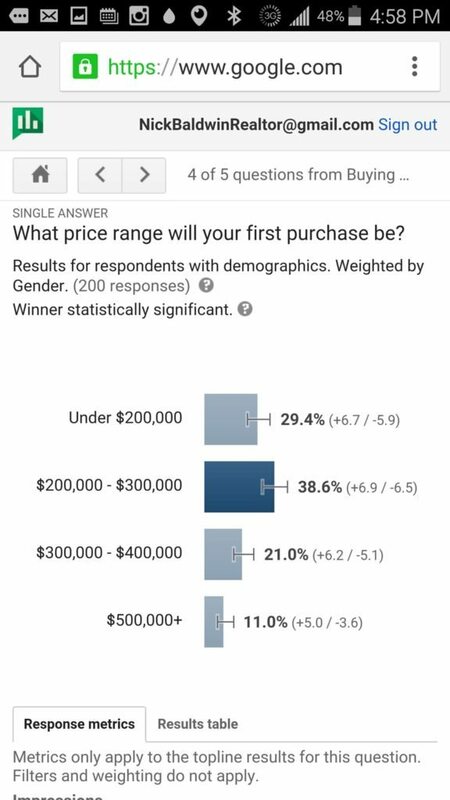 Shortly after learning of the tool at Google’s real estate event, Baldwin paid $300 for responses from over 4,000 people to a five-question survey (see screen shots of the results below). 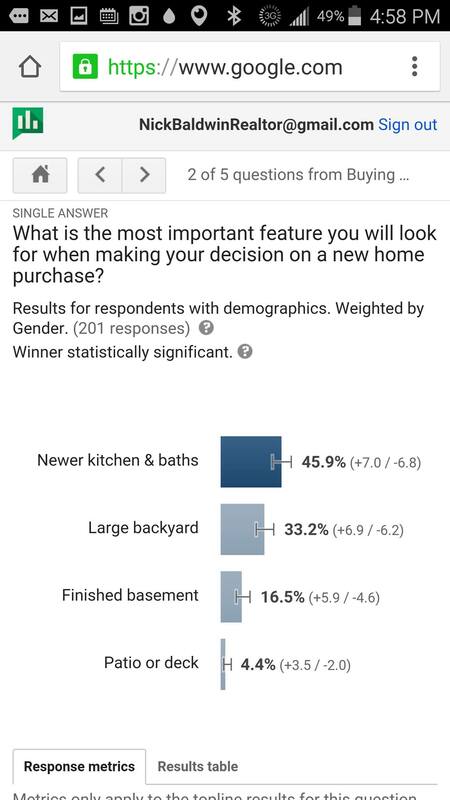 One of the survey’s more actionable findings was that half of respondents who plan to buy a home in the next year said newer kitchens and baths will be the most important feature they look for. Baldwin says he may use that result to get sellers to chew over renovating a kitchen, painting its countertops or switching out appliances. “Put $1,500 or $2,000 into the kitchen to freshen it up because 46 percent of people who might buy this house are looking for that,” he envisions advising a client. 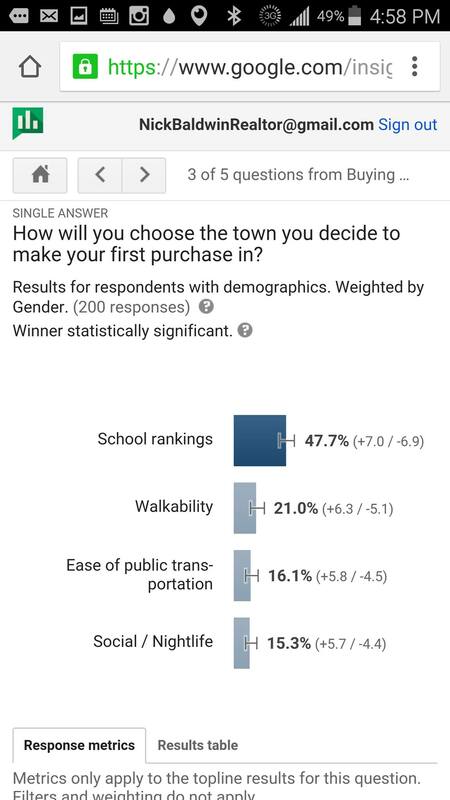 Google collects survey responses by prompting netizens to answer questions in exchange for free access to content — such as news articles — from companies that have partnered with Google. 2. Review thinkwithgoogle.com and sign up for its newsletter. Real estate agents can learn how to leverage Google to grow their business by visiting thinkwithgoogle.com and signing up for the site’s newsletter, Baldwin said. The site features use cases of companies from an array of industries that have used different types of Google advertising to attract business, explores marketing philosophies and strategies and explains the different Google tools companies can use to grow their business. Ahumada has traditionally run ads on Facebook featuring a listing photo and property description. But after learning more about “zero moments of truth,” he’s decided to press the pause button on that approach. “Zero moments of truth” refer to major events likely to spur people to make changes in their lives. In real estate, zero moments of truth include having children and getting a divorce. Google emphasized that marketers have the most success when they tailor messages to zero moments of truth. Ahumada’s plan is to produce a video that targets new parents. It would show a couple falling in love, having a child, visiting an apartment, realizing they need a house, looking up his team’s website, seeing a property with an agent from his team and then buying a home. 4. Video tips: Go heavy on emotion and trends, easy on branding. Part of the goal of Ahumada’s video is to elicit an emotional reaction in the intended viewer. That was one tip Google had for attendees interested in producing engaging marketing videos, Ahumada said. Another, which can be deployed across multiple marketing channels, is to tie a video into an Internet trend. Real estate agents can discover trends by conducting real estate-related searches at google.com/trends. Don’t saturate a marketing video with branding, Ahumada also learned at the event. Instead, slip logos and the like in carefully, perhaps only after the video concludes. While “zero moments of truth” present lasting windows of opportunity to marketers, “micro moments” offer smaller ones. They refer to moments — often prompted by stimuli, such as commercials — when consumers conduct some sort of inquiry and are particularly open to considering certain products and services. Baldwin’s takeaway from discussion of micro moments at the event was that real estate agents should think carefully about how to build content and advertising around real estate-related micro moments. That might mean penning blog posts about interior design or mortgage down payments and paying to advertise those posts in Google search results to people who search phrases related to interior design and mortgage down payments, Baldwin said. Can virtual reality player Augmented Pixels strengthen your sales?